Tom P: Want to hear a joke? Give a man a gun, he can rob a bank. Give a man a bank, he can rob the world. Now, let's keep that in mind. 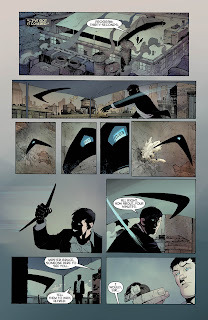 I've mentioned it here before, but I was a big fan of Scott Snyder's Detective Comics storyline 'The Black Mirror' - it's one of the best Batman tales in years and cleverly used and respected the Dark Knight's continuity. It had roots in Year One which, along with The Long Halloween and Dark Victory, forms my favourite Batman period - I love that era. It's dark, gritty and corrupt. In Year One the filth of Gotham almost seeps from the page. Batman's mistakes are real. They have weight and cost, and even when we get to The Long Halloween he's still making them. There's the trust he puts in Harvey Dent as the man he can't be (and perhaps wants to be) who ultimately becomes as dark and twisted as the city he was trying to save, becoming a product of change. Part of the new order. Freaks. I say freaks because that's what old Gotham calls them (which is an issue I have with the Court of Owls, but back on topic!). What is old Gotham? It's gangsters, pimps, thugs and corrupted institutions. A city drowning in its own mess. This is the world that killed Bruce's parents, this is the world he wanted to stop. He went away, studied and trained to become something that could stand against that corruption. To create a better city. The thing I've always loved about that is ultimately he became something so strong that he inspired a new era of crime for Gotham. Year One, The Long Halloween and Dark Victory illustrate wonderfully how the old order of crime could not cope. Batman worked so well against the Mob that it turned to the freaks Batman inspired or created. Its the theme of escalation that Christopher Nolan would later take from these masterworks. 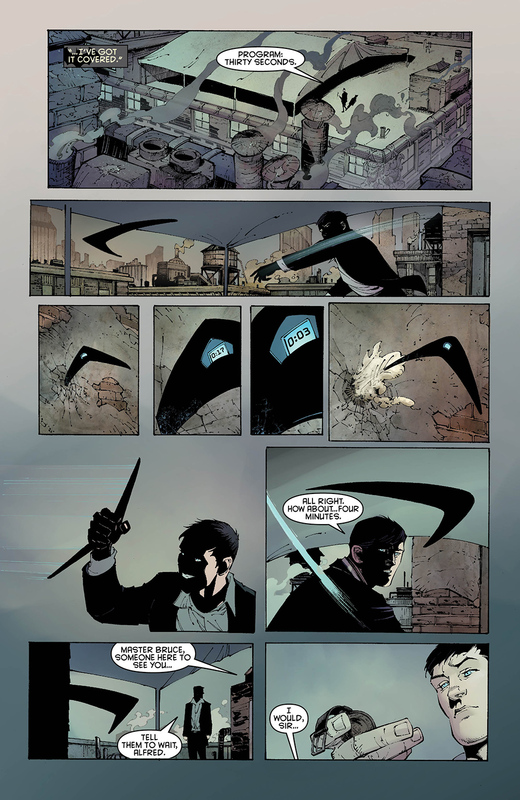 So my problems with the New 52's changes to the Dark Knight's mythos became all too apparent with Batman #0. The world that Miller, Mazzucchelli, Loeb and Sale created is clearly no longer canon. 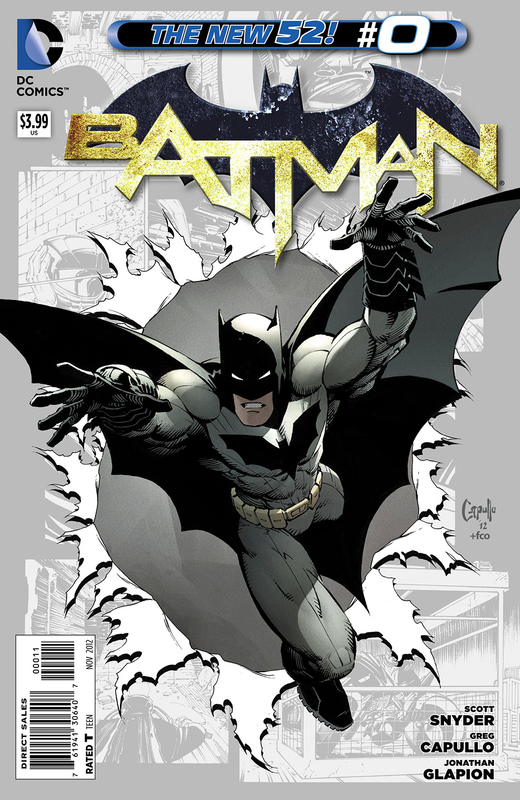 In the backmatter of this issue, Batman's first appearance is listed as 2011's Justice League #1! I have a problem with that because the aforementioned books created such a perfect start for the character. He doesn't need a Tron style motorbike. Now I love me some Tron, but Batman is not Kevin Flynn. He is, in my opinion, far too reliant on his gadgets in this new origin. It takes away from the hard work and skill of the man. Let's not forget he's a detective first. I agree his money is his superpower but so is his sheer will to change his city. It's a bad sign when you have to force yourself to read something, and looking online I can see a lot of love for this new Batman issue, but I don't buy it. The backup is worse, trying to squeeze three Robins into five years. Five years?! You can't blame Snyder, the man is a great talent and writes some of the best stuff on the stands, but even he can't sell this. I work in construction and was trained primarily as a bricklayer. It took three years and still I had much to learn. I can't believe that you could train all these kids in that time, and when you factor in Damian it becomes a real mess. This was a poor editorial choice - why put a time limit on something? Rome wasn't built in a day, let alone five years.